It's no secret that Massachusetts is a regulation heavy state. It's been a long held maxim that if you want to get anything done in this state, you have to know the ins and outs of the system and it never hurts to "know someone." We're one of the few states that still enforce colonial era "blue laws" that many feel have become antiquated and outdated. 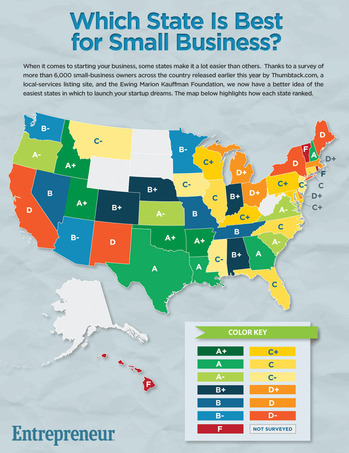 And last November, in a survey released by Thumbtack.com and the Ewing Marion Kaufman Foundation, Massachusetts scored among the lowest of the 50 states as a place where it's easy to start a small business. The Commonwealth scored a D+, while New Hampshire scored an A. You can see how other states fared by clicking on the image within this post. Aiming to take steps to change that perception, Governor Deval Patrick announced in March a plan to overhaul the state's thousands of regulations, to see where things could be streamlined or processes eliminated altogether. This week, the Governor proposed legislation as a part of that review. Specifically, the legislation is aimed at regulatory boards. Patrick announced his administration would eliminate or change 286 state regulations as part of its ongoing review of the bureaucracy in state government that the governor launched last March. To date the administration has reviewed 446 sets of regulations out of an estimated 2,000 on the books. Patrick had originally projected that the first 1,000 regulations would be reviewed by the end of 2012,with all being reviewed by the end of 2013. Some of the specific changes included eliminating or changing some of the 31 boards under the Division of Professional Licensure. The legislation will consolidate the boards of registration of barbers and electrologists into a new Board of Registration of Cosmetology and Barbering, eliminate the Board of Registration of Radio and Television Technicians, and put a cap on workforce re-entry fees for licensed specialists.